With economic uncertainty, escalating interest rates, and a shifting regulatory environment, organizations that invest in treasury management solutions achieve stability. Business Solution Partners provides SaaS Treasury Management Solutions that empower CFOs, Treasurers and Controllers with the cash visibility and reporting power to optimize cash, control bank accounts, manage liquidity and ensure compliance. Download The BSP eBook "Kyriba: Your Trusted Global Partner For Treasury Management Solutions" Now! Treasury management solutions provide significant business benefits, enabling the control and scalability to simplify the way you run treasury and finance operations. Connect in real time your diverse ecosystem of Banks, Applications and Data to enable Automated Posting, 3rd Party Payment Processing, and the exchange of AR and AP data. Ensure sufficient liquidity to meet your organization's financial obligations. Business Solution Partners are the Treasury Management Experts. Our team is on the cutting edge of the SaaS business software ecosystem. Our unique insights enable better financial operations through the application of Software, Strategy and Training. We are focused on bringing clients into the future with cloud-based software and modern processes. Business Solution Partners has exclusively selected Kyriba as our SaaS Treasury Management solution. We work closely with the Kyriba team to ensure that NetSuite clients utilizing the platform achieve seamless onboarding, flawless connectivity and the training they need to succeed. 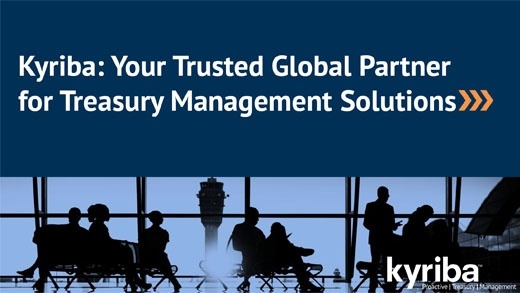 As a Kyriba Gold Partner, we have several dedicated Kyriba Solutions Providers with the necessary experience to take your treasury operations to the next level. Want to learn more about Kyriba, and how Business Solution Partners can enable your Finance team to achieve better results with Kyriba?